The Pringles Coupon Contest is open to legal residents of Canada only who have reached the age of majority in their province/territory of residence. The Pringles Coupon Contest ends at 11:59:59 PM EST on December 31. To enter the Contest for a chance to win one (1) of three million, one hundred eighty seven thousand two hundred fifty-four (3,187,254) instant win prizes go to pringleseverycanwins.ca and follow the online instructions to complete and submit the entry form. There are three million one hundred eighty seven thousand two hundred fifty-four (3,187,254) Instant Win Prizes available to be won at the outset of this Contest. Three million one hundred eighty seven thousand two hundred fifty-four (3,187,254) PIN Codes are randomly seeded. Every can is a winner. 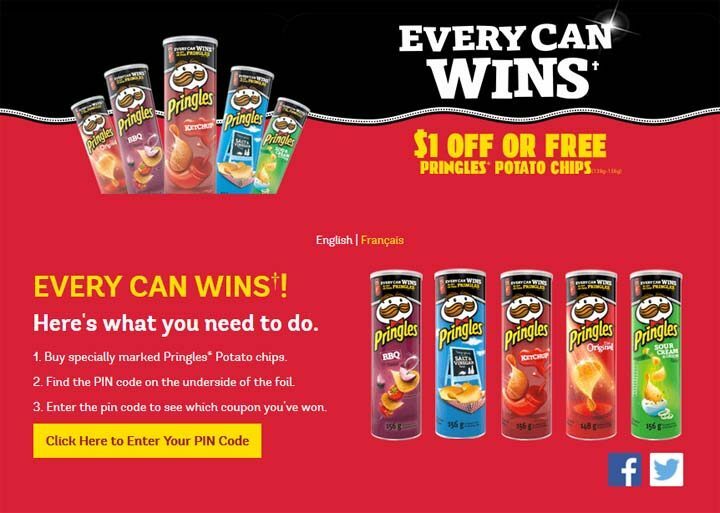 Approximate odds of winning are 1 in 1.1 for the $1.00 off a can of Pringles Potato Chips (139 g – 156 g) coupon and 1 in 10 for a free can of Pringles Potato Chips (139 g – 156 g) coupon. The number of Instant Win Prizes available will decrease as prizes are awarded.